Still Seeking Sanity: Not Me Monday! This is something I have been reading a lot around the blogosphere. It gives us the opportunity to share our lows, while pretending it was not us that were less than perfect. Cuz, you know, I aim for perfection around here. Anyway, I have been thinking about starting, but now I am swayed by the fact that there are now prizes for giving it a go. Here's the first installment of Still Seeking Sanity's Not Me! Monday! In an attempt to get out the door today and finding I had no black socks, I did NOT just steal a pair from my hubby's drawer instead of trying to find a matching pair of my own out of the sock bin. Lazy? Maybe. Resourceful? Oh, yeah! I have NOT fed my kids some cheese every day for lunch since I gave up dairy, just to watch the lovely cheese fall in nice even slices as I cut it, and certainly NOT so I can just smell it. Just a little. The boys are NOT currently just in a shirt and diaper, since they spilled dinner on their pants and in an attempt to keep laundry from completely overtaking the house, we did NOT decide to let them go until bedtime with no pants. Grant did NOT just walk up to me, his diaper in hand, while I am blogging and nursing Drew. I did, however, one-handedly put the diaper back on. Grant does NOT have a diaper wedgie cause I cannot get it straight with one hand. And I did NOT just pray, "Dear God, please do not let him poop in the next ten minutes. Please! Amen." Grant must have immediately gotten his diaper re-attached and made a beeline or the kitchen table, where he got ahold of Emma's milk from dinner and for fun, threw it at Ben's face. Ben was standing in front of the couch, so the couch was just covered in milk. I detached Drew from his dinner, and put him down while I got a hold of the cup and cleaned up the mess. While I was scrubbing milk out of our white couch, Emma (who was told to put her milk out of reach of the boys in the first place but did not do it,) came up to me and said, "Mom, you promised wen you were done feeding Drew you would read to me! And YOU'RE NOT READING!" I did NOT then give my four year old the evil eye and yell at her. Nope, not me. Alright, I have to quit blogging or Grant just might burn the house down. 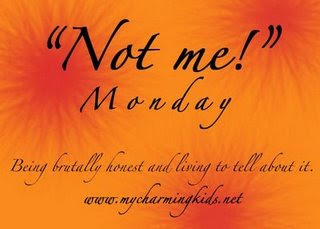 Hope you enjoyed this installment of Not Me! Monday, and I will try to do it again, you know, if I ever can keep the days of the week straight. ROTFL!!! I would pay to see you put on a diaper one handedly while nursing!